Get together at the Clarion Inn and Suites at the International Drive hotel in Orlando, FL near Walt Disney World. 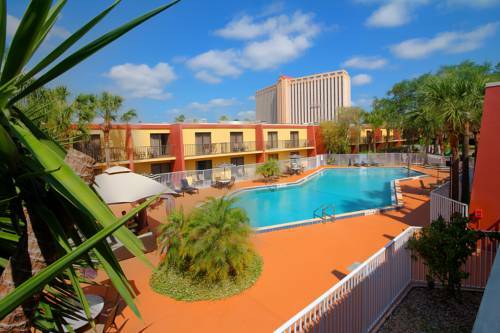 Nearby attractions include Universal Orlando, SeaWorld Adventure Park, Disney Downtown Marketplace and Old Town Kissimmee. Orlando Orange County Convention Center and the Orlando International Airport are also close. Take advantage of free breakfast, free WiFi, outdoor pool and free weekday newspaper. All rooms come equipped with a flat-screen TV, hair dryer, coffee maker, safe and desk. Some rooms include refrigerators, balconies and hot tubs. Also, earn rewards including free nights and gift cards with our Choice Privileges Rewards program. Effective Jan 15, 2014 100.00 USD deposit is required for cash-paying guests. Jacuzzi/Spa is currently out of order until further notice.